The design for Weston Pass Hut is inspired by European style ski huts and underground earth structures. We built the interior to have an open floor plan layout. 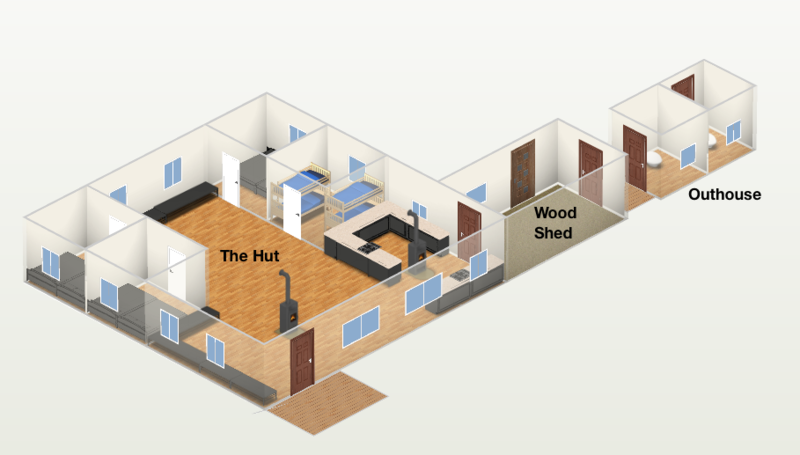 The footprint of the hut is a spacious 40ft by 40ft creating 1600 sq. ft of usable space with an addition 800 sq. ft basement used for storage (2400 total sq. ft). This allows us to tailor functionality for the needs of our customers while preserving heating efficiency during the cold winter months. The Great Room is 1200 sq. ft and each of the four private bedrooms are 100 sq. ft each.This layout offers a large sleeping capacity of up to 20 guests. The floor and roof are framed with locally milled and sustainably harvested lodge-pole pine. There are three roof beams that span the structure and consist of stacked 8×8 beams. The vertical support posts are also 8×8 posts. The roof planks are exposed from the interior and are old growth fir 2x12s. The one-level design is perfect for accommodating handicap accessible needs. As a backcountry haven, our hut is entirely unique. Three walls and the roof are covered with earth, which helps the hut blend into its extraordinary surroundings and provides natural insulation. Its dry-stacked construction, numerous 8×8 locally-milled beams, and steel braces contribute to an exceptionally strong structure. The strength of structure combined with its natural exterior provides a sense of permanence that is only outmatched by the vast mountain environment that surrounds it.